I figured out how to select and remove the addresses of some recipients who have rotated out of a group. I can't find the instructions for adding the email addresses of new group members (I have their information in my Personal Address Book) to the same existing Contact or Distribution list. Is it trivially simple? What are the steps? baumgrenze wrote: I figured out how to select and remove the addresses of some recipients who have rotated out of a group. Now you can remove old and add new e-mail addresses. Thank you, this is just the help I wanted. I found the email addresses I wanted to add in the To: of a recent email and copied and pasted them. The 'Display Name' in the paste was a copy of the email address. It needed to be hand edited so that it displayed correctly. If there is a way to copy an email address and its Display Name from the Personal Address Book page, or a way to link a new entry in a Distribution list with the entry in the Personal Address Book, I did not find that. Thanks again for patiently pointing me in the right direction. Display address book list in right address book panel. 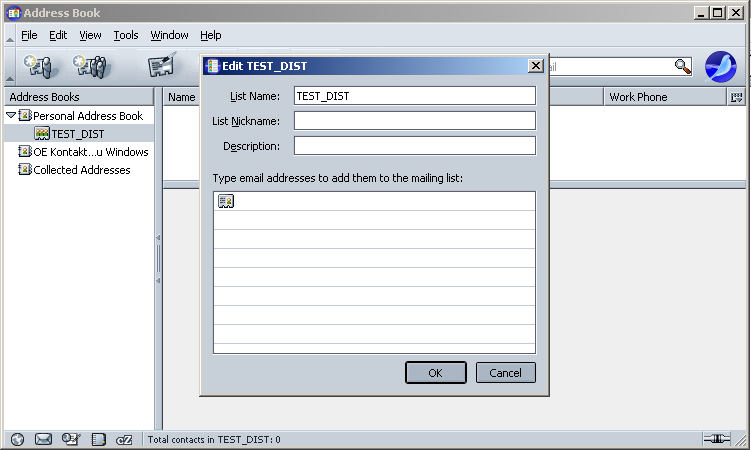 Drag item from right pane and drop on the mail list name in the left column. When you've added all the items you want, click on the list name in left column to display contents in right pane. I start all my list names with a period to sort them to the top of the address book to make them easy to locate. Also, typing a period into the TO field when composing a message brings up a menu of all my lists from which to choose. List names with spaces in them have been reported to cause some people problems.